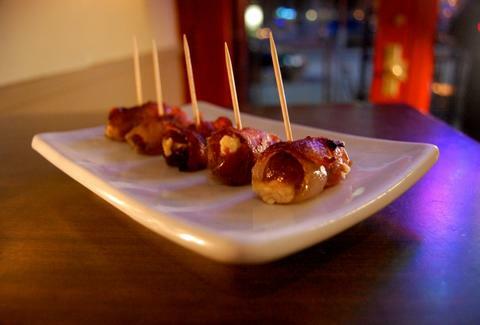 Pig Wrapped Dates Cory Chigbrow, Pintxo Cooked up by Belltown's most acclaimed small plate slinger, this orange juice-glazed finger food mans up dates via bacon and cayenne, and even looks like little footballs, though they in no way lead to a... wait for it... tight end! The Big D Dog Laura Olsen, Po Dogs The chef-trepreneur behind the Cap Hill gourmet meat-missilery elevates the usual BBQ sauce'd Texas-style dog by adding guacamole and onion rings, which aren't as shiny as Super Bowl rings, but taste better, and more importantly, are available in Seattle. Beer Bowl Ruadhri McCormick, Re:public A group-friendly concoction from the chief cocktail-slinger at 2010's most feted bar, this ginger beer-based punch spices up rum with ingredients ranging from honey to thyme, so make sure you've got enough, lest you run into a Thyme Crisis.